My friend Neil was waiting for me at the River Lodge parking lot. Leaving my truck there, we headed east on Highway 36 for the 20 minute drive up the Van Duzen River. It was a beautiful day, with blue sky and our goal was to paddle a pair of sea kayaks on this 12 mile reach to the Eel River, then the 3 miles of Fortuna. On the dirt road leading to our "put-in", I waved to a friend as he prepared for some Steelhead fishing. The Van Duzen and Eel Rivers were once famous for these spectacular sea-run trout, but the legendary spawning runs are greatly reduced. Many fishermen hardly bother anymore. At the river we unloaded and pushed off into the beautiful blue-green water. I have been a student of the Van Duzen River ever since I moved into the middle of its watershed 25 years ago. During the quiet winter nights it speaks to me with the power of a constant roar. In the spring when the color is right, I rattle down it's rapids. There are the cooling summer swims followed by autumn forays, hopping across on boulders to look for the remaining resident rainbows or a group of spawning chinook. My interests in floating the lower river was to view some of the recent bank protection and fish restoration projects that had been completed in the last few years with the cooperative efforts of local landowners and government agencies. These projects aim to protect eroding private lands, while improving fish habitat for the instream migration of the Steelhead and their cousins, the Coho and Chinook salmon. Good fish habitat is rare on the lower Van Duzen, with the once deep channel filled in with sediment and a scarcity of large woody debris to provide hiding places for the young fish. In summer, the water sometimes reaches lethal temperatures for salmon and trout, and the flow goes underground on some of the riffles. The high water temperature benefits the predatory non-native Pike Minnow, making this part of the river even less available to the young salmonids. One of the projects upstream is to direct the river away from undercutting a grove of two thousand year old redwoods. Several have already fallen in, now tightly cabled together in a jumble where the power of high water has broken and twisted the 4-5 foot diameter logs like match sticks. Before breaking downstream, they pointed at the massive sand and rock bar that facilitated their demise. The large gravel bar has been building on the south side of the river, forcing it into the groves of ancient trees. High winter flows undercut the trees, and they fall into the river and float into the private lands downstream, where they are quickly cut up and hauled away to local lumber mills. The first winter after the downed trees were secured, schools of Chinook salmon spawners were seen resting under the logs, and later, juvenile Steelhead trout were observed in the deep pool during the following summer months. Within an easy walk upstream there are several landslides. One is notable in it's monumental size, having dropped massive amounts of mountainside into the river less than ten years ago. An old bent up culvert and the edge of the remaining forest above offer clues to the cause. Floating downstream, we maneuver past the streamside homes of some Carlotta residents. Some of these landowners were recently advised by an the adjacent industrial logging company that they should increase the size of culverts in the seasonal creeks on their property, in order to accommodate expected larger flows due to timber harvest activities. Residents are justifiably concerned. I have been attending meeting of an active group, the Friends of the Van Duzen, where we pour over maps that describe the diligence of these lumbermen. Our written comments, aimed at protecting riparian zones and pointing at cumulative effect that are generally refuted and ignored in the final plan. The state and federal agencies exercise their turf wars while the ground that they are mandated to protect get washed out from under us all. We are deafened by the winter long chatter of helicopter that fly by our homes lifting trees away from their exposed mountainsides. Yet, our members presift by conducting water monitoring studies, educating local students and actively organizing the community around water, timber and helicopter issues. Less than a mile from our start, the river cuts into a sandstone cliff that towers over a new stretch of river bed. It created a 20 foot high island, the result of another large slide on a small tributary. It is common knowledge that this region was logged extensively during the past 100 years. The combination of forest canopy removal, road construction, the highly erosive terrain and 5-6 feet of annual rainfall, has caused extensive changes to the lower river channel. It may be said the I have become overly sensitive to seeing forest that I have watched grow for nearly half my life being , being clearcut, burned, and poisoned with herbicides in massive swaths. Yet, the valid question remains as to whether the current 20-30 year-cycles of harvest can be sustained by the fragile soils of these mountainsides. Recently, in a white paper done on the business practices of the company in question, Michael W. Gjerde, of the office of the State Water Resources Control Board, stated, "PALCO's has harvested at unsustainable rates for the entire time that MAXXAM has owned PALCO. In 1987, a publicly released PALCO timber cruise gave an estimate of 6.5 billion board feet (bf) of harvestable timber available to the Company. In 1997, the next publicly released timber estimate gave 3.2 billion bf of timber remaining. This yields an average of 300 million bf/year for 10 years between 1987 and 1997 - this rate of harvest is equivalent to a 20-year harvest cycle. A 20-year harvest cycle is not sustainable. In the 1998 Headwaters deal, an "allowance" of 176 million bf/year was granted . Dividing this into the 3.2 billion bf remaining timber gives an average 18-year harvest cycle on 1998 timber volume, or requires that future harvests naturally decrease rapidly from initial levels. The MAXXAM PALCO historical timber harvest rates have lead directly to greatly reduced harvest levels in the 20th year of MAXXAM's ownership of PALCO. This is not surprising since Redwood and Douglas Fir trees take much longer than 20 years to grow to harvestable size. MAXXAM has effectively mined beyond a renewable forest resource level. This harvesting model puts the forests of PALCO at risk from over harvesting which would create environmental harm." The Van Duzen has taken a large share of this form of land 'stewardship'. Of the 25,000 acres owned in this watershed by MAXXAM, last year alone showed that there were 32 THP's involving 4,984 acres. As of May 2nd they have seven plans out for 1,294 acres. The maps show that nearly all the forests in their 25,000 acre ownership have been entered in the past 15 years. As we paddle along, the valley widens past Cummings Creek where the channel braids out islands from what once were adjoining flats and pasture. An elderly life long resident described to me how the river use to hug the south side of the valley in a deep shaded channel. Today it braids across a broad gravel bar, cutting bare channel banks along the adjoining pastures, where we soon come to one of the recent bank restoration projects. Mounds of large "rock points" and logs are positioned and secured along the river bank, and areas of willow, alder, and cottonwood have been planted to reduce erosion and eventually provide shade. The rock/log structures serve to deflect the high flows, while creating deeper pools for fish habitat. This project was designed and built, with the support of the landowner, by a non-profit group of restoration engineers called the Eel River Watershed Improvement Group (ERWIG) that directs equipment contractors and crews from the California Conservation Corp (CCC). Most of the funding came from state and federal salmon restoration bills and bond measures (that are now drying up) distributed through the California Department of Fish and Game and the Humboldt County Resource Conservation District. Meanwhile, the CCC Salmon Restoration Program has been eliminated. This successful state program has worked for years on projects up and down the Eel River watershed. It was a match funding generating program, exceeding it's goals with $43 million of non-general fund quotas, giving a great education of hands on work experience to thousands of 18-22 year olds. Looking up from here into the surrounding mountainsides, these restoration activities are in stark contrast to the logging now taking place. We watch through binoculars as another clear cut is carved by men operating high-lead, tractors, chainsaws and trucks. This is work by another timber corporation, Green Diamond, formerly known as Simpson. The patchwork of adjoining clear cuts, work that they have been doing for the past 20 years, can be plainly seen over the five mile stretch of the Carlotta community. I ponder if there can't be a better, less destructive way. In the current system, local residents and small landowner rights seem to take a backseat to corporate profits and short term jobs. Opposing "science" on both sides of the issue become battles of terminology and "prove it". There have been some positive activities; the restoration efforts, and attempts to join together with all factions to work toward win-win solutions. But why should taxpayers have to foot the bill for projects to repair ongoing environmental damage by large corporations. Or, why should small landowners have to replace culverts to allow for activities of their upstream neighbor. I must refer to a letter written to James Madison by Thomas Jefferson, "The Earth belongs in use to the living...no man can by natural right oblige the lands he occupies, or the persons who succeed him in that occupation, to the payment of debts contracted by him. For if he could, he might during his own life, eat up the use of the lands for several generations to come...the Earth would belong to the dead and not the living generation...no generation can contract debts greater that may be paid during the course of its own existence." As I see it, the debts that have occurred, the loss of entire runs of salmon and steelhead under successive deposits of mountain soil, are too large a price to pay by our children and their children. 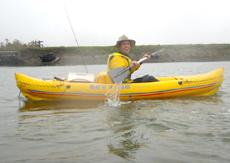 We make quick work of the wide flat waters in the lower reaches. They are punctuated at turns by various attempts to stabilize the banks using stacked rock, broken concrete and rock points. Passing under the highway bridges the river makes a sweeping turn north to its mouth at the Eel. This is a stretch that has been engineered the past three years, providing a safe passage for fall chinook runs. Under leadership from the California Department of Fish and Game, the property owner's gravel business has timed and built low water holding habitat and a notched levee that blows out with the first adequate rains to allow the run to commence. These kind of complex measures are now needed in order to protect the remaining fragile runs of salmonids, now designated as threatened by the Endangered Species Act. Sports-fishermen on the Van Duzen watershed along with most of the waters in this region are reduced to catch and release. The Van Duzen, with its dense tree lined rugged riparian zone, its constantly changing waters, and its nourishment to an entire array of wildlife is what makes this region so special. As a fisherman, my first catches of steelhead and salmon were on this river. I treasure the memories of the bursting displays of these silvery sea runners fighting with all the strengths of the river. They nourished me and my family and connected us in a visceral way to the watershed. This product of our public trust is becoming rare as we accumulate the short-term financial compromises made in the watershed. The native culture here thrived on an abundant fishery for thousands of seasons. As in the entire region, our culture has been the steward of this watershed for 150 years. How many more times will it sustain such a volume of corporate, industrial resource extracting without collapse? Is it time to review our culture's priorities pertaining to restoration and sustainability? There are already many landowners here that see the value in caring for their lands. These are the values that need to be passed on to our corporate neighbors, given their mandate to exist for the betterment of society.